Promises "low-end punch" and "transcendent highs"
Put your hands in the air... and let LANDR take care of the mastering. 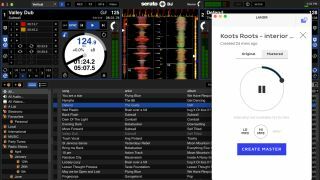 Since its launch in 2014, LANDR has certainly set the automated cat among the mastering pigeons, and the company has now announced a new set of tools for DJs. The LANDR DJ Engine is designed specifically for "electronic and hip-hop DJs" who want a quick and easy way of mastering their music effectively. "Mastering is a universal need for all types of music, but different genres require different variations of artificial intelligence," explains LANDR CEO Pascal Pilon. "Our new DJ Engine, which can level any track at any stage, uses a specific algorithm tailored to electronic and hip-hop DJs that is designed to focus on the low end while adding punch and weight, and also offers clear, transcendent highs without harshness or distortion, ensuring the end result sounds the best it possibly can. "We're excited about the groundwork this new feature lays for LANDR and hope to roll out new integrations that cater to the changing musical landscape in the future". The DJ Engine offers the same features as the standard LANDR platform, but promises to "enhance the overall sound while protecting the transitions, build-ups and breakdowns". The company has also announced a partnership with Native Instruments that will make it possible to master the Stems format via the DJ Engine in the near future. "Native Instruments is excited to be part of the launch of the LANDR DJ mastering app and thrilled that it will soon give users access to affordable and easy Stems mastering," says Ronny Krieger, Director of Content at Native Instruments. "Mastering your DJ sets and tracks is an essential part of making them sound great. LANDR offers a great platform for musicians who are looking for a seamless production experience as well as for DJs who want to make their sets sound professional." Find out more about the DJ Engine and give it a try on the LANDR website.